Bicycle hire - you can cycle to the Mont Saint Michel via the cycle route with spectacular views on the way. The journey will take between 20-30 minutes. We make a minimal charge to enable us to maintain and replace the cycles when needed. 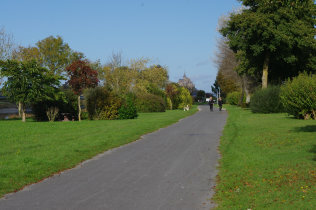 The cycle route to the Mont St Michel - no traffic! Collection from Pontorson railway station or Mont Saint Michel, and drop off for your return journey. Once again there is a minimal charge to cover our costs. Packed breakfast for those wishing to make an early start. Evening meals, prior arrangement required so that we can prepare fresh meals for you to enjoy. A few days ago, when tides were high on the Norman coast, something wonderful happened. The most celebrated small island in the world became a real island for the first time in more than a century. Or almost an island. The same thing will happen when tides are abnormally high in the coming month. By next summer, Mont Saint-Michel, a spectacular rock, 1,300-year-old abbey and medieval village two kilometres off the French coast, will be a true island once again at all high tides. In 1874, the abbey at the Mont Saint Michel was declared a historic monument by the French, and in 1979, it was added to Unesco’s list of World Heritage Sites – one of the first to be granted the coveted status.